My family is always on the go. From running everyday errands like grocery shopping, bank trips, going out to eat, play dates, and dance lessons. Now that school has started I find myself even busier. Making sure my girls always have a snack while on the go is so important, especially so their not hungry or cranky going from one event to the next. Finding a mess free snack is always my number one goal. Jif To Go provides just that. Not only are they the perfect portion of real Jif peanut butter and crispy pretzels. They are MESS FREE! Have you ever tried packing pretzels and peanut butter in separate bags? Take it from me, it's a messy situation. Especially with a toddler! That’s why Jif To Go Dippers are truly the best on the go snack! The Jif brand's first all-in-one portable snack is available in two varieties: Creamy Peanut Butter with Pretzels and Chocolate Silk Peanut Butter & Chocolate Flavored Spread with Pretzels. My girls really love the Peanut Butter & Chocolate Flavored, I catch them dipping their fingers in the spread after eating all the pretzels! 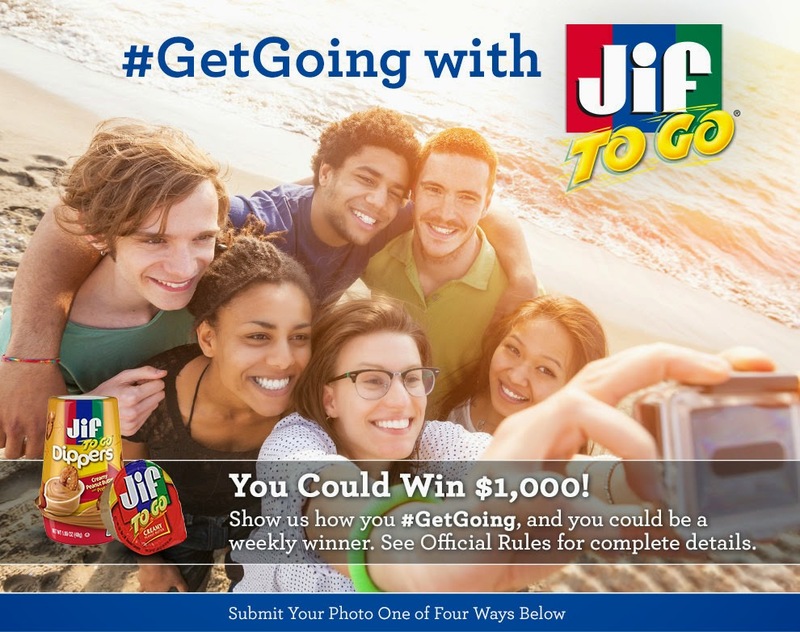 From August 20 through October 1, 2014, Jif To Go® is celebrating life on-the-go by asking fans to share a picture of how they get going in the #GetGoing photo promotion. Fans can enter each week for a chance to win $1,000 to use for their next adventure. Share your photo on your personal Instagram page and tag your photo with @JifBrand and the hashtag #GetGoing in the caption of the photo to receive one entry into the random drawing for that week! It's that simple! If I won I would take a trip to Florida with my family. My girls have been talking about going to Disney non stop and I wouldn't mind sitting under a palm tree on a gorgeous beach! After meeting Elsa and Anna of course..
From dance lessons to weekend trips, Jif To Go Dippers provide a convenient and delicious snacking solution for a life on-the-go. If you won the $1,000 in the competition, where would you go? For more product information and details on how to participate in the Jif To Go #GetGoing promotion, please visit http://www.jif.com and check out Jif on Instagram (http://instagram.com/jifbrand) Facebook (http://www.facebook.com/Jif) and Twitter (https://twitter.com/jif). The #GetGoing photo promotion is open to legal residents of the 50 United States and D.C., 18 years of age and older. Void where prohibited. No purchase necessary. See Official Rules for complete details. If I won I'd go on a cruise somewhere as a family. I need to try these, I have a toddler and we are always on the go. She is always asking for a snack. Those are great on the go snacks. My daughter loves peanut butter so I have to get her some. My ultimate dream vacation would be to go to Hawaii. Those snacks are perfect to toss into my backpack and head out on an adventure with my kids. We love PB in this house we need pick up some of these! I would pay off some bills, but plan my next vacation somewhere / anywhere!! I would travel with that money. This is a great campaign by Jif as it gives them a recall with fun and on-the-go events. The snacks would be fun for my kids on football nights/days. And if I win? hmmm I hope that thought of paying bills leave my mind right now. I want to take the kids shopping!!! These make a perfect snack for anytime. My daugher loves PB, so these are great for her lunchbag! Very interesting photo competition - goodluck! I absolutely love jif to go. If I won I'd get work done on my house. These dippers sound delish and much less messy than the usual good for you snack. I love JIF peanut butter!! If I win, I will take my 3 big kids to a much needed family vacation. . . maybe a road trip! Love Jif Peanut Butter. It's the better alternative for a school snack too. If I won $1,000...I would definitely go traveling...to see my stepson whose away in college. I could do a lot of small trips with that kind of money or a really nice big trip. I am happy for either. This is the brand peanut butter for my children who love peanut butter and sandwiches. What a great giveaway. The price is pretty amazing. There's no purchase necessary but I think that joiners would want to make a purchase to get a hold of the item. If I won, I would give it to my family. This is a really cool contest. $1,000.00? Epic staycation. If I won $1,000- I'd head back home to the midwest to see my family. I love Jif! Thanks for sharing this contest with us! $1,000 sounds like a great staycation to me. I can't see us going anywhere, unless it's to NYC to see family. If I won a $1000 I would go shopping...lol However I would probably need to be responsible and pay something off so in all honesty that would probably be what I would do. I have no idea what I would do with $1000! I need to do so much! We will only use Jif in our house. What a great contest! I need to try these! What a great contest! If we won, I would take my family to DisneyLand. Thanks for contest. I would go to Florida! What a fun prize that would be. Jif is our favorite brand for peanut butter. Great giveaway, if I won I will take my family to Cars Disneyland. What a fun competition! I keep seeing these Jif To Go's, but keep forgetting to pick them up! What a great prize! Our family is on the go ALL the time! We go to Disneyland for sure! If I won I'd probably go on a cruise! I really want to try one with my family. If I won I would go to Ohio with my family to visit family. This is a great contest Jif is doing. Thanks for sharing. I like that you can enter each week. It sounds like a great contest to enter. I would love to take my family on a cruise. It would be great to spend a week together doing something fun. i would so love going on a trip!!! Nice promotion and I love Jif! The girls and I all love that stuff! Jif FTW! That's a great question. I think I might go back to San Francisco again. These looks like a great snack and makes it easy to bring with you places and pack in lunch boxes. Not sure where I would go though if I won 1,000. If I won I would go to Disney too for sure! My oldest girl has been wanting to go like forever! This looks like a great snack to pack in her lunch. These are great snacks! I sometimes put them in my sons lunchbox! If I won the money, I'd definitely take my family to Hawaii! We've always wanted to go there! Oh we are a great fan of Jif pb but pretzel is out. We would have it with banana as a great snack or afternoon bite. Great lunch bite for the family. I love Jif, yummy! If I won I would be in Disney faster than fast!